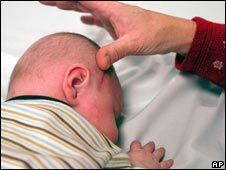 Baby born with 'foot in brain': "US surgeons operating on a brain tumour in a baby boy found a tiny foot inside his head. Doctors operated on three-day old Sam Esquibel after finding what looked like a microscopic tumour on an MRI scan. But while removing the growth, they also found a nearly perfect foot and the partial formation of another foot, a hand and a thigh. The growth may have been a case of 'foetus in foetu' in which a twin begins to form within its sibling."